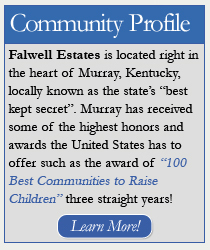 Falwell Estates is the newest exclusive subdivision in Murray, Kentucky. Located on the southwest edge of the city, Falwell Estates provides a beautiful country setting with all of the amenities of living in the city. Our community, situated in the sought after West End of Calloway County, will captivate your senses from the moment you enter it. 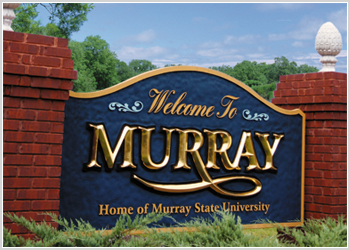 An attractive tree line, rolling landscape, natural preserves and calming winds are just a few of the scenic surroundings found in the this Murray, Kentucky community. Extreme attention to detail was taken in laying every single home site, while still maintaining a sense of warmth and sincere appreciation of the natural beauty that surrounds the area. Homes in the Murray, Kentucky subdivisions have steadily increased in value over the years. Living in Falwell Estates is a solid investment for your future. Falwell Estates is a community all families can call home. There are a wide variety of lot sizes and amenities including paved streets, all underground utilities, including cable television and fiber optic internet, provided by New Wave Communications, and city water and sewage. 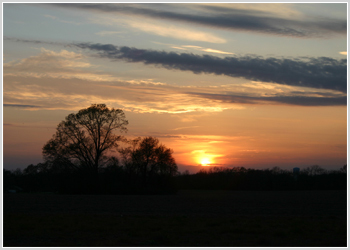 Lots are located on a gently rolling terrain and average over ½ acre in size. Deed restrictions ensure that your new home in this exclusive, upscale community will meet your needs now and in the future.